Rental equipment in the Hollywood area for quick delivery to local studios as well as on location in the So Cal area. The following OSHA approved rental equipment is available: trampolines, mini-trampolines, stunt pits, crash pads, crash mats, air bags, springboards, traditional gymnastics equipment and unique shaped mats (mailboxes, octagons, trapezoids, donuts & barrels). One rental fee includes reliable delivery, set up and a professional stunt trainer to provide actors with safety instructions regarding the use of the equipment. 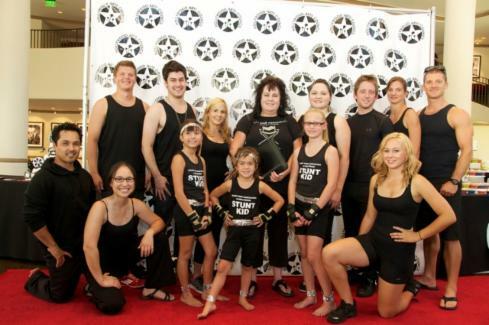 Stunt coordinators, action choreographers, gymnastics coaches, tumbling & stunt trainers and assistant stunt coordinators. Professional staff members will train and rehearse actors on action skills required for a specific scene. They will provide training and choreography for mini trampoline stunts, power tumbling, free running, unarmed stage combat, weapons, low falls, high falls, fencing, gymnastics, sport acrobatics, dance acrobatics, physical humor, vaudeville, stair falls, slapstick, window penetrations and stunts with breakaways. Baby wranglers, child wranglers & 2nd A.D.s who are all "kid friendly" and have had plenty of on-set experience with very young talent! The company's wranglers will keep youngsters quietly entertained, happy and in good spirits while in holding or the dressing room. There are several young stunt kids who are well trained in stage combat, falls and mini-trampoline stunts. The young talent that the company manages, includes both union & non-union actors, stunt kid performers and background, who are all experienced in television & film as well as fun to work with. Adult stunt performers, doubles and action actors are also managed by Lasky Productions. Many of the stunt performers play 18 to look younger. Members include both union and non-union stunt performers and action actors, ranging in a span of ages from 18 to 58.